The Yucatán Peninsula is home to 500 resident and 120 migratory bird species. A new project unites the peninsula's three nations to monitor and conserve this critically important region. Birds are ambassadors for our relationship with the Earth. Thanks to thousands of donors and thousands more citizen scientists, we have the power to analyze this information—and listen to what the birds are telling us. Our Multimedia Productions program worked with acclaimed cinematographer Neil Rettig and the Philippine Eagle Foundation on a documentary film to inspire conservation of this magnificent raptor. Thanks to friends like you, the Cornell Lab of Ornithology is a healthy and effective organization. 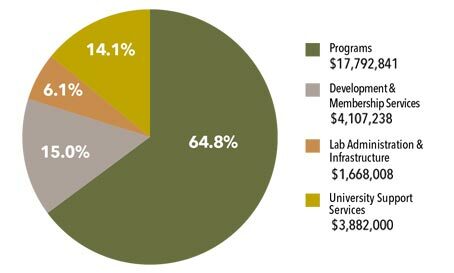 Nested within the fabric of Cornell University, the Lab’s strength lies in its unique institutional model that weaves together research, academics, outreach, and conservation, and in the support of thousands of members and donors—our single largest source of support. 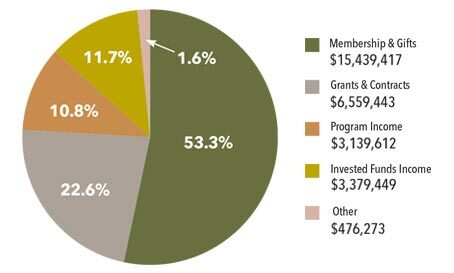 This year, members and friends provided 53.3% of our annual revenue, a total of $15.4 million that fuels innovation, growth, and scientific excellence. The Lab has experienced healthy growth over the past 10 years with revenues exceeding expenditures, allowing us to expand and strengthen our vital research, education, and conservation efforts. We are deeply grateful to our more than 100,000 members and donors at every level, all of whom make it possible for the Cornell Lab to advance the understanding of nature and engage people of all ages in learning about birds and protecting the planet. We're pleased to include a downloadable list of our leadership supporters here.